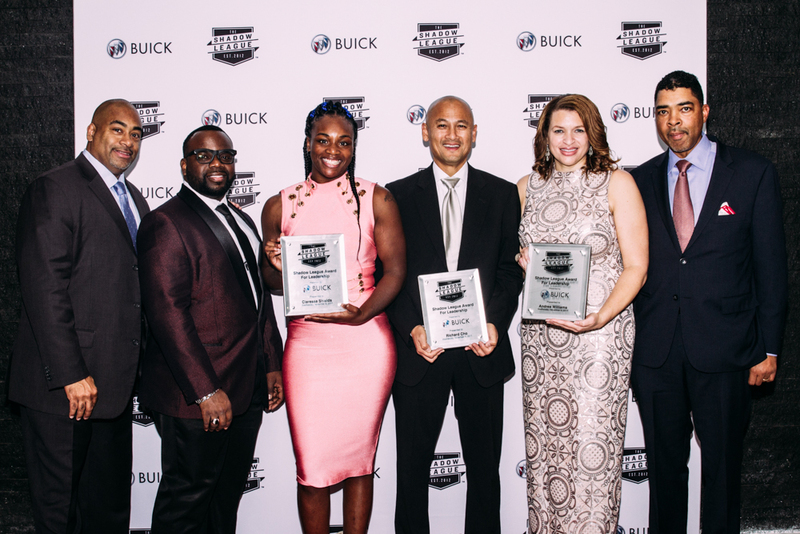 The 4th Annual Shadow League Awards presented by Buick held on Wednesday, November 8th at ESPACE (New York City), was a huge success. Over 130 friends and supporters of The Shadow League were in attendance to honor three extraordinary trailblazers in sports; Richard Cho, General Manager of the Charlotte Hornets, and the first Asian American general manager in NBA History, Claressa Shields, Women's WBC and IBF Super Middleweight Champion and the first American boxer to win consecutive Olympic medals, Andrea Williams, Commissioner of the Big Sky Conference and the first African-American Female to serve as commissioner for a Division 1 Conference. During the cocktail hour, guests were entertained by the soulful and eclectic sound of Eliki. DJ D-Nice rounded out the evening creating an uplifting spirited vibe with music from several genres that kept the audience on their feet. Entertainment journalist, Gia Peppers, who among other things also serves as the voice of the Washington Wizards, served as the Master of Ceremonies introducing attendees to the honorees. Before closing the program, GM of The Shadow League Yussuf Khan announced The Shadow League would screen its first full-length documentary entitled “Flexatron- Becoming Shawn Rhoden” under Shadow League Films in February 2018. The documentary profiles Shawn “Flexatron” Rhoden, one of the top bodybuilders in the sports arena. The documentary is about more than Shawn's story; it’s a tale about how sports can inspire, shape and, ultimately, save lives. 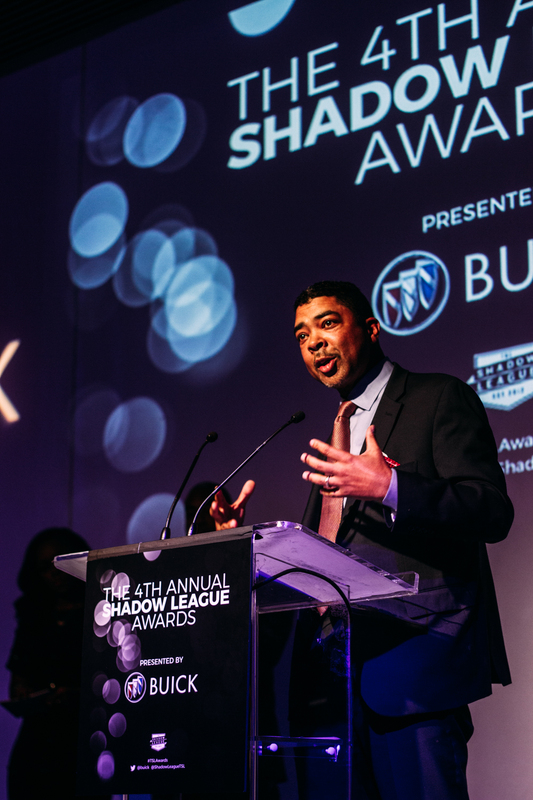 Buick’s partnership with The Shadow League has continued to grow over the past two years, including engagements during NCAA College Football and Final Four. During the evening, both the Buick Encore and Lacrosse were on display for attendees to experience. This has been a busy week for Buick as the brand just announced the debut of the Buick LaCrosse Avenir, Buick’s highest expression of luxury, which is expected to arrive at dealers in early 2018. With the arrival of the 2018 LaCrosse Avenir, Buick’s new sub-brand expands its offerings and provides customers a way to experience the highest expression of Buick luxury. First introduced with the 2018 Enclave that went on sale in October, Avenir features unique styling cues, an extensive set of standard features, a more dramatic look and exclusive premium materials for customers who want more. Features available on other LaCrosse models come standard on the Avenir, including a powerful 310-horsepower V-6, nine-speed automatic transmission, navigation and Bose Centerpoint Surround Sound premium audio, as well as a panoramic moonroof. Additional available features include Ebony interior, Intelligent Twin-Clutch AWD, Dynamic Drive Package featuring continuous variable real-time dampening control and a suite of advanced safety features. Since 2014, The Shadow League has honored and celebrated individuals in sports who excel and remove barriers outside of the mainstream. In an industry that inspires us all to utilize our determination and strengths in a positive way, there are unsung heroes who impact sports in ways that may not be covered on the nightly news, yet their impact resonates on the various courts, fields and arenas across America. Previous TSL honorees' have included David Rone, former President of Time Warner Cable Networks and Time Warner Cable Sports, Leonard Ellerbe, CEO of Mayweather Promotions, Christine Simmons, President & COO, LA Sparks and Terence Crawford, Unified Light Welterweight champion. Buick is an international modern luxury brand offering vehicles with sculpted designs, luxurious interiors and thoughtful personal technologies, along with responsive-yet-efficient performance. 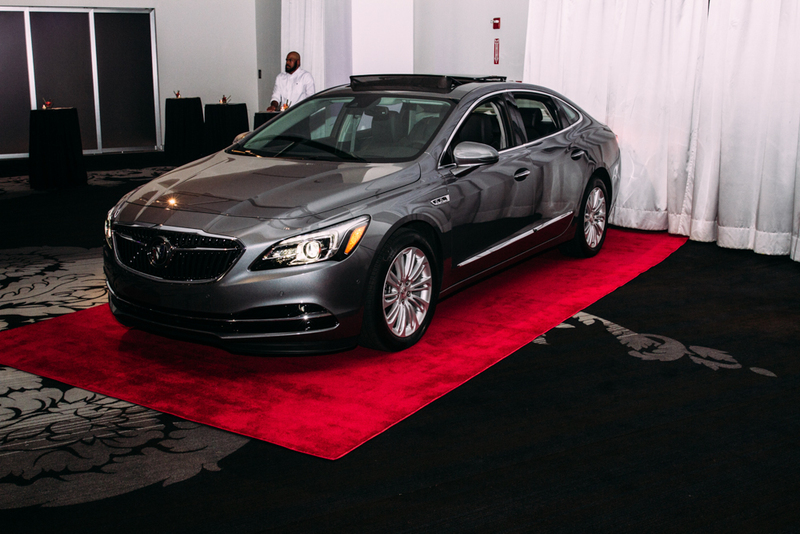 Buick is attracting new customers with its portfolio of award-winning luxury models in North America and China. Learn more about Buick cars and crossovers at http://www.buick.com, on Twitter @Buick, on Instagram or at https://www.facebook.com/Buick/. The 4th Annual Shadow League Awards HonoreesLR Yussuf Khan (GM, The Shadow League), Lester Booker, Jr. (Buick Communications), Claressa Shields (Honoree; Women’s WBC and IBF Super Middleweight Champion), Richard Cho (Honoree; General Manager of the Charlotte Hornets), Andrea Williams (Honoree; Commissioner of the Big Sky Conference), and Keith Clinkscales (CEO, The Shadow League) 2018 Buick Lacrosse on Display at the TSL Awards on November 8, 2107 The 4th Annual Shadow League Awards presented by Buick, Keith Clinkscales (CEO, The Shadow League) gives opening remarks.